Mexican salsa recipes Find out why salsa is so popular and healthy. Mexican Salsa Recipes – The Healthiest Mexican Food You Can Eat! Cooking Mexican food requires that you have some Mexican salsa recipes. There is just no getting around that. Salsa compliments Mexican food beautifully. Nowadays people are putting salsa on everything. If you are interested in fruit salsas, I’ve got a couple of mango salsa recipes and a pineapple salsa recipe and a cranberry salsa recipe for you to try. How about shrimp salsa? This has a nice roasted corn flavor with avocado. Don’t miss it. Did you know that salsa is the best selling condiment in North America beating out ketchup? I believe that the reason salsa is so popular is because it is such a healthy, easy, and flavorful way to compliment many Mexican dishes and other foods. Let’s start with the healthy part. Salsa is made with fresh ingredients, mainly fruits and vegetables like tomatoes, bell peppers, pineapple, onion, garlic, peppers and any other vegetable you like. It’s low in calories and high in fiber. You also get quite an antioxidant punch of vitamins, minerals and phytochemicals. If you haven’t’ heard of phytochemicals you might be interested in knowing that these compounds, found in fruits and vegetables, help to prevent cancer, diabetes, cardiovascular disease, and hypertension(1). So if you are interested in preventing damage to your cells, preventing cancer cell replication, or decreasing cholesterol levels, keep reading. Did you know that more than 900 phytochemicals in fruits and vegetables have been discovered with more being identified everyday? The National Cancer Institute has sponsored “5 A Day For Better Health”as a prevention strategy and to encourage people to get more fruits and vegetables in their diet. Making salsa is an easy, tasty way to help you accomplish this goal. Mexican salsa recipes are easy to make. First let’s start with the ingredients. Ideally they should be fresh, right out of your garden if you have one. You just can’t beat home grown tomatoes. Their flavor is outstanding and will produce the best tasting salsa anywhere. If you don’t have a garden, visit your local farmers market. Here you will get the freshest vegetables with the most vitamins. Once you have all of your ingredients, making salsa is just a matter of chopping everything up and eating it! … and more. Just use your imagination. The beautiful thing about a salsa recipe is that you can get as creative as you want. There is no absolute right way to make salsa. Saute the finely chopped onion in the 1 Tbsp. olive oil for 20 minutes until golden brown. You canomit this step if you like your onions raw. I happen to like mine cooked and sweetened some by the cooking process. When you are done cooking the onions, add the finely chopped garlic to the onion and saute for one minute more. Remove onion/garlic mixture to a bowl. Slice and chop tomatoes into 1/2 inch size chunks. Ideally you want all of your ingredients about the same size. Cook the carrots in boiling water for 2 minutes. You want the carrots to have a crunch so don’t overcook them. Rinse under cold water to stop the cooking process and cool them off. Chop the carrots into 1/4 inch chunks. Cut off the stem and slice the jalapeno length wise and then chop very fine. Add all the ingredients to a bowl and stir. And there you have an easy, healthy, and flavorful salsa you can add to your tacos, enchiladas, rice and beans or any other favorite dish. Remember, you can get as creative as you like with our basic mexican salsa recipes and add all kinds of different vegetables and fruits. It’s a good idea to try and chop everything about the same size when making salsa and to chill it for an hour or two before serving. Fruit salsa doesn’t hold up as well as an all-vegetable salsa and should be eaten the same day it is made. Grilling some of the ingredients, such as the tomatoes, onions and peppers, can add a wonderfully different flavor to the taste of your Mexican salsa recipes. So don’t hesitate to try this. Experiment and have fun! 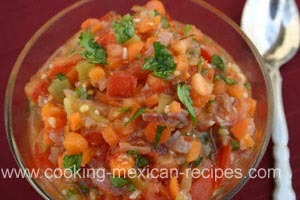 Check back again as I will be adding more Mexican salsa recipes. How is hot sauce different than salsa you ask? Salsas are typically chunky and made with fresh vegetables and herbs. Hot sauce is usually smooth like Tabasco, hotter as in spicy and usually contains vinegar. At least that’s how I see it. Try making hot sauce with Chipotle peppers. We think you’ll love the flavor. 1. Bloch, A. et al. 1995. Position of the American Dietetic Association: Phytochemicals and functional foods. JADA.95: 493-496. 2.Polk, Melanie. 1996. Feast on Phytochemicals. AICR newsletter. Issue 51.